Our goal is to breed correct, milky does in a small herd setting. We strive to make all our does longer, taller, and milkier. We are local to the beautiful Mendocino County, CA. Generation after generation of excellence. Welcome to the Goat-San Dairy Goats website. We are a small herd local to Sonoma County, California. We primarily raise LaMancha’s, but we also have a few LaMancha type Grades, Nubians, and are excited to be starting a small Saanen Project. We generally keep between 12-15 milkers, and about 9 kids every year. Because we keep our herd very small, we often have high quality milkers and youngstock for sale. Please enjoy browsing through our website, and don’t hesitate to contact us with any questions. I (Trinity) grew up very close to Dairy Goats. My mother and father, Walter and Karen Smith, started up Wingwood Farm in the late 70’s just north of us in Mendocino County, and have been raising Nubians for the past 40 years. When I was a child we kept a fairly large herd, usually ranging between 20-30 milkers. My sister and I were homeschooled, so we spent a lot of time working on the farm, and learning about dairy goat husbandry and exhibition. When we were old enough, we joined 4-H and continued to hone our skills until we graduated high school. When I was young I loved the goats, however I also was very attracted to many others things, especially sports, acting, and wanting to be a normal teenager. I would often get frustrated at the time and energy commitment that the animals took. When I graduated high school and left for college, I was determined to leave behind the “goat world” and experience other things in life. However, I needed to have an income during the summer time and clipping as well as showing was something I was good at, so I spent my summers clipping and showing for herds all over Northern California. It was during these summers that I rekindled my love for dairy goats and the people within this eccentric world of “Goat”. I grew especially close to Grant and Micki Colfax of Shining Moon Alpines, Karen and Krista Senn of Kastdemur’s Nubians and LaManchas, and Joannie and Charlie Rowe of Rowe’s Toggenburgs. These three herds really started me on the path to success, and helped me begin to hone my skills as a breeder /showman/fitter through their knowledge , and letting me work with some of the best animals in their respective breeds. With these three herds being the main influence in my return to goats, I had the chance to work with Alpines, Toggenburgs, Nubians and LaManchas very closely. I knew right away that there was something very special about LaManchas, and was instantly drawn to them. Specifically, on a trip to Harrisburg, PA for the 2004 National Show, this gangly junior kid Lamancha named “Up Yours” stole my heart. During those moments, I knew that I was back in the business, and LaManchas were the breed! Once I graduated from Pacific University (Forest Grove, Oregon) in 2006 with a BS in Exercise Science, I was so glad to have had that college experience... but I was ready to come back to farming. Always knowing that I was a California girl, I searched Northern Californa for a career opportunity in farming, specifically goats. 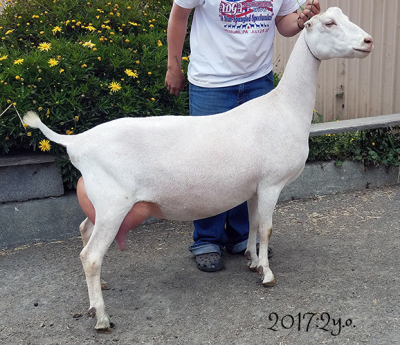 My family had known Jennifer Bice of Redwood Hill Farm for many many years, and I had seen how successful she was not only in dairy goats, but in business. So I applied for a job at Redwood Hill, and so started the next chapter of my life. I started at RHF in the fall of 2006. While I had worked extensively with goats my whole life, nothing prepared me for the “dairying” life. Over the next 8 years I learned more about goats, farming, business, and management than I could have ever imagined, all the while honing my skills even further by having the opportunity to work with some of the best animals in the country. 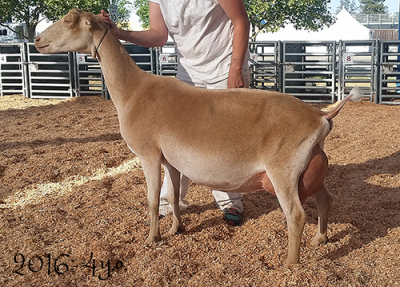 Along with the three previous herds (Shining Moon, Kastdemur’s, Rowe’s), Jennifer and Redwood Hill Farm really brought me the success that I enjoy in the dairy goat industry, and for that I am forever grateful. The actual Goat-San herd came about in 2006. I had told Karen Senn that I wanted to start my own LaMancha herd with a doe kid, more specifically, an Up Yours daughter. In 2006 GCH Kastdemur’s Love Me Dew came to live at Redwood Hill, followed by GCH Kastdemur’s StartYourUprising (my UpYours daughter!) in 2007. I thought of our herd name during a bout of “gaming” one day. I needed to have a screen name for a game I was playing. My father started working overseas when I was in junior high, and has been a world traveler ever since. He visited Japan many times, and when he would tell his stories he would always talk about how the people called him Walter-San as a term of respect. Goat-San just popped into my head that night on the computer. Respect the Goat! In 2011 I was so happy to have my wonderful husband Andrew join the “herd”, followed by our amazing son Ian in 2013. In early 2013 I made the hard decision to leave Redwood Hill and move our herd to a small farm in the hills above Santa Rosa. During my time at Redwood Hill, the Saanen breed, which I had never worked closely with, captured my heart and so Goat-San LaManchas became Goat-San Dairy Goats. While I maintain the herd most of the time, it is also a family affair. Because I'm a Judge and Appraiser for the American Dairy Goat Association, Andrew jumps in to help take care of the goats while I am away, and for that I am forever greatful. Thank you to all those who support us. A special thanks to my loving husband for helping me design, personally host, and maintain this website.